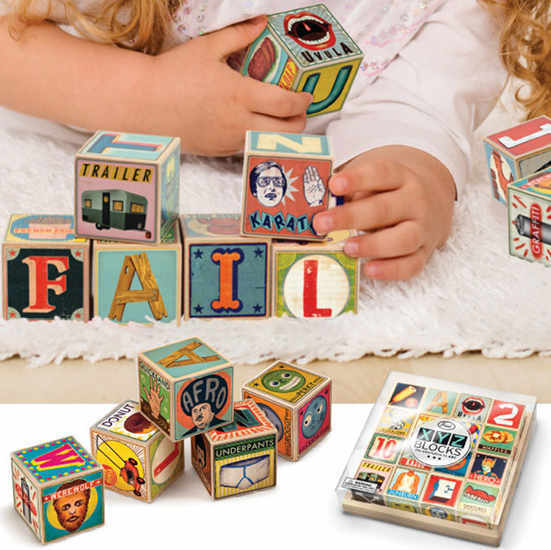 Though I’m not quite sure why the little girl up there is spelling out the word fail, there’s little doubt about how gorgeous and character-filled those blocks are. The XYZ Blocks by Fred are definitely something a little different in the world of wooden blocks and may well be the first choice for parents who enjoy retro art. Artist Christian Northeast has amusingly twisted the traditional with A is for afro, W is for werewolf, K is for karate and H is for hero. My eldest son would no doubt chuckle at the underpants block – a much less tame option than the trusty umbrella that’s been used thousands of times over to represent the letter U. If you like an artsy edge to baby’s toys, then the XYZ blocks are available for $44.95 from Urban Baby. They come to you in an attractive wooden base with recyclable plastic lid and are a memorable newborn gift.